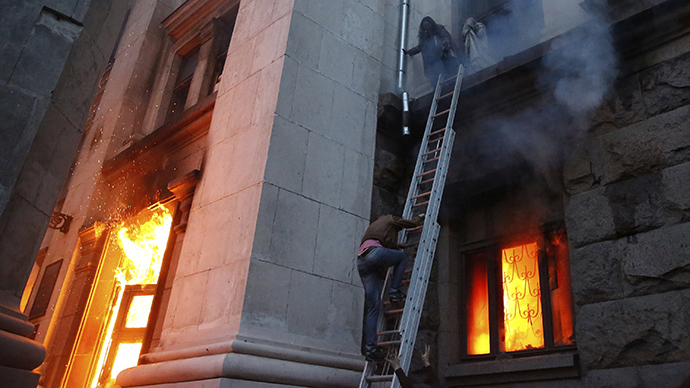 A member of the Ukrainian parliamentary probe into the Odessa massacre has retracted her signature under the document, saying it was heavily redacted after signing. Multiple Odessa news outlets published what they said was the original probe conclusions. Svetlana Fabrikant, a member of the Ukrainian parliament and secretary of the parliamentary commission probing into the massacre in Odessa on May 2, as well as other episodes of violence in eastern Ukrainian cities, withdrew her signature under the commission’s report, saying it was “different” from what she had signed. “Regrettably, other members of the commission made some adjustments to the document after I had signed it,” she said. “After the document was published on the official website of the parliament, I found my signature under a different document - and I cannot agree with this document,” Itar-Tass quotes her as saying. 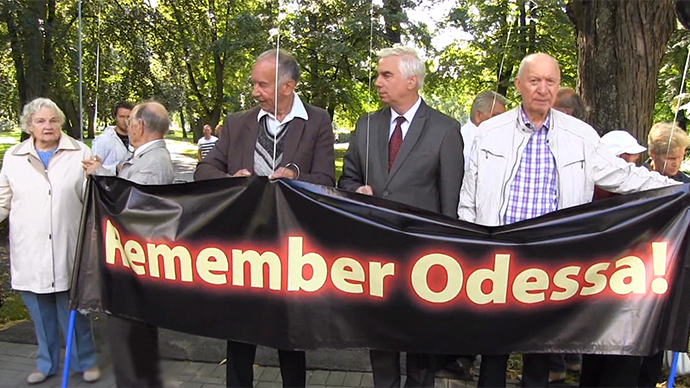 After the comparison of the version published by the parliament and the one obtained by Odessa media outlets, it can be concluded that the 'redacted' version got rid of witnesses’ accounts implicating the involvement of Andrey Parubiy, then-secretary of Ukraine’s National Security and Defense Council, in organizing the Odessa massacre. Parubiy resigned from his post in August. 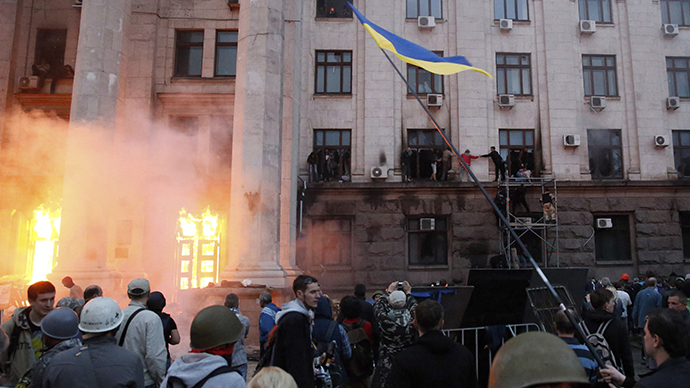 The final version of the report presented by Kiev is also reportedly missing witnesses’ accounts about the involvement of about 500 radicals who have been transferred to Odessa with the help of the region’s governor, Vladimir Nemirovsky. It also failed to mention the head of Odessa branch of the Udar party, Andrey Yusov, and other Euromaidan leaders who allegedly instigated radical nationalists to set ablaze the Trade Unions House. Svetlana Fabrikant said that Parubiy, as well as the chief of Ukraine’s Security Council, Valentin Nalivaichenko, and Interior Minister Arsen Avakov refused to talk with the commission’s members during the investigation. “Key participants in those developments had never showed up at the commission’s sessions. The reluctance of officials to provide explanations to the commission is an eloquent answer. What kind of openness and joint work can we speak about?” Fabrikant said, claiming that the authorities wanted to soft-pedal the investigation of the Odessa tragedy. At least 48 people died, and over 200 were injured, in a series of events that led to an inferno in the Trade Unions building on May 2. 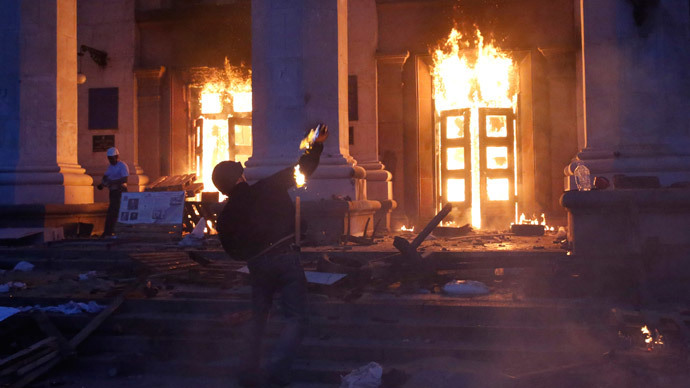 After clashes erupted between anti-government protesters and radicals supporting the Maidan-imposed authorities in Kiev, the latter set on fire the Trade Unions House, where anti-Kiev protesters found refuge, as well as their tent camp. The actual death toll could be much higher, as many of those who managed to escape the flames were then either strangled or beaten with bats by radicals, according to numerous witness reports. 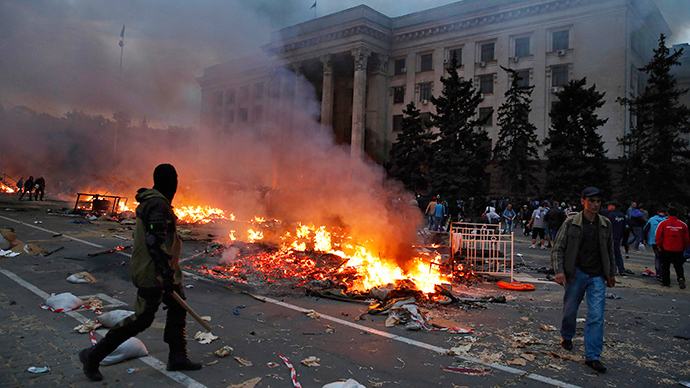 “The Ukrainian authorities are seeking to drag out the investigation. Those who were behind the tragedy have not yet been named,” Nikolay Skorik, the former governor of the Odessa region and a member of the investigation commission, told the media. The official version of the report does not arrive at any significant conclusion into the causes of death for those trapped inside the burning building. 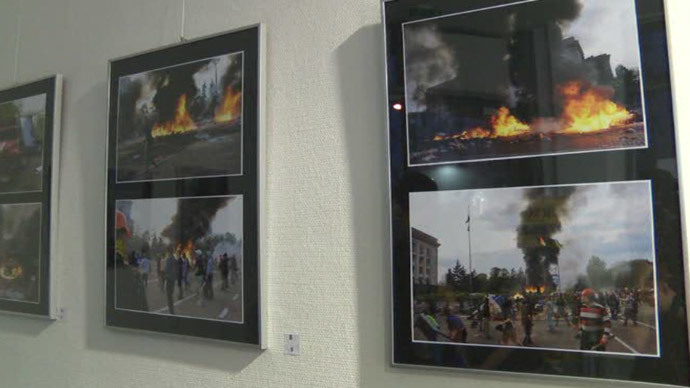 It says that after the camp of anti-Kiev activists had been set on fire, people tried to find shelter in the Trade Unions House that was also set ablaze. Forensic examination revealed that nine people had died from carbon monoxide intoxication, 13 had died from combustion gas intoxication, 12 had died from burns, eight had died from injuries as they jumped out of windows, and six had died from gun wounds. One of those killed in the Trade Unions House has not yet been identified.